Many colleges and universities strive to create a fulfilling college experience and education for their students while working to improve access, student success, and public confidence. The Institute provided ideas and tools for Chief Academic, Financial and Enrollment Management Officers to advance their institutions. 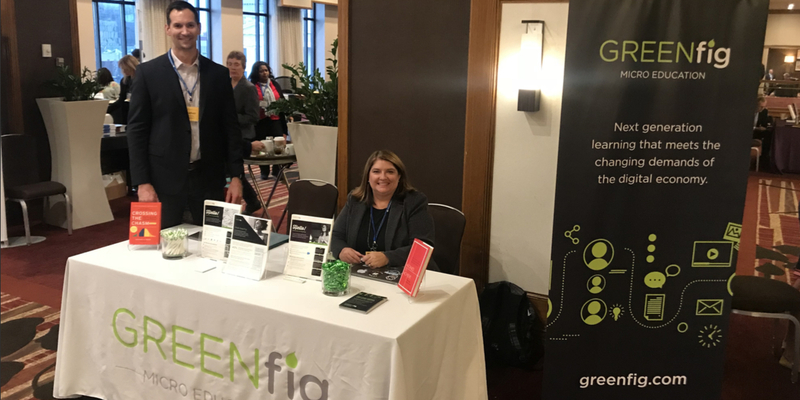 GreenFig was able to share its passion with these leaders by introducing an innovative program that helps bridge the digital skills gap as graduates enter the workforce. Shifts in the economy brought about by technology have disrupted how colleges think about preparing students and sparked renewed debate about what role, if any, colleges should play in preparing students for the “good jobs” many are seeking upon graduation. For many, institutional missions provide a “north star” for what to do - one reason why educators are investing to help students discover their vocation via experiential learning and then helping students align vocation with occupation to lead purpose-filled lives. Hands-on experience, the right digital credentials, and the universal skills from a liberal education are in high-demand – putting colleges that prepare students with these outcomes in a position to thrive. The last night of the Institute, GreenFig hosted an intimate dinner to explore these ideas and build relationships with select colleges that attended CIC CAO Institute. The night provided great company, amazing food, and intelligent conversation. To continue and expand the dialogue, GreenFig will be hosting a free webinar for academic officers titled “Why the Digital Economy Needs More Liberal Arts Majors” on Tuesday, December 11th and Thursday, December 13th at 10 a.m. PT / 1 p.m. ET. We invite you to join us!